We are brokers to both buy and sell fine quality jewelry, diamonds and colored stones. Many customers today consider our products highly valuable, easily transportable assets. Fine quality jewelry and gemstones offer both pleasure to the wearer and investment potential to the buyer. Our specialty items are made to last a lifetime and for the generations to come. Joden World Resources is a custom design jeweler with an on-premises manufacturing facility. Our own craftsmen are expert in the restoration of your treasured heirlooms and in the creation of your heirlooms of the future. We offer custom made, one-of-a-kind, settings made in house. We have a complete line of high quality, handmade English settings for which we own the exclusive rights of distribution in this country. We also stock over a thousand original settings from the Victorian period to present day. Everything we sell comes with an appraisal that is analyzed by two GIA certified gemologists. We wish to give you our personal attention to help you pick out your select gems and settings. 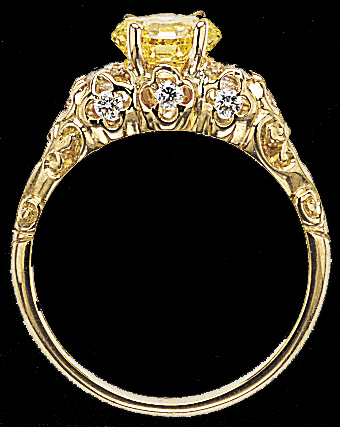 We provide certifications and appraisals for our quality yellow diamonds. If you have a serious inquiry, we would be delighted to talk to you directly on the phone (800-747-7552). Please give us a call. Or if you in the neighborhood, we invite you to visit our store and meet our staff. If you prefer, you may email us your questions , and will do our best to get back to you within two business days.